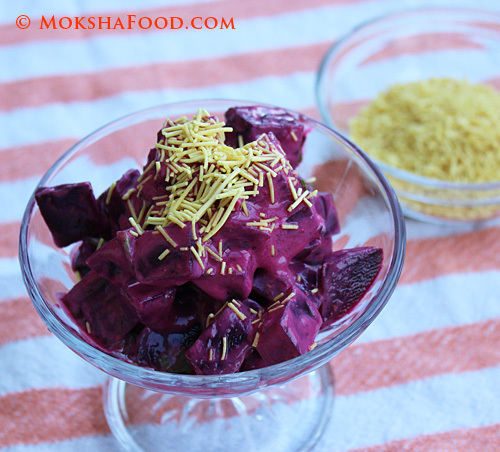 Roasted Beet Salad may be the most popular trend but has anybody tried a Roasted Beet Chaat? Chaats are Indian street snacks popularly craved for their sweet-spicy-tangy flavors. 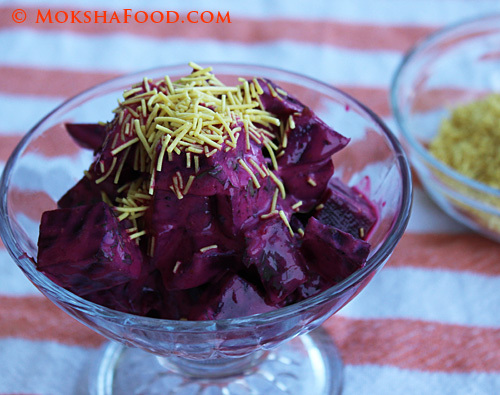 Roasted beets pair very well with Indian chutneys and this is one junk food your body will love too. I always appreciated beets more for their color than their taste. After I was introduced to roasting them, there was no looking back. I regularly make roasted beet dip and beet salad but wanted to try something new. 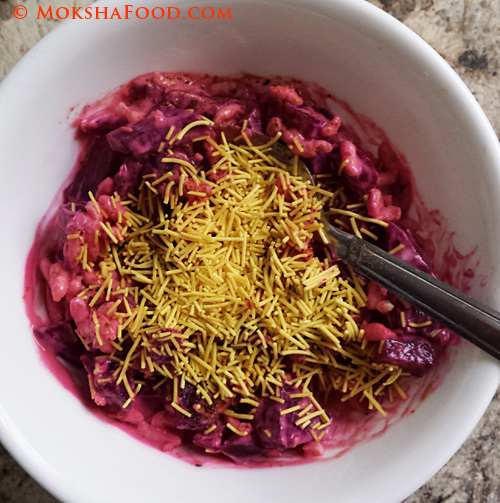 This Roasted Beet Chaat is the perfect way to start my New Years on a healthy note. I made them two ways, one like a regular bhel with rice crisps, sweet tamarind and spicy mint chutney and the other like a chaat with yogurt, chaat masala, dried mint and cilantro leaves. Both ways it tastes awesome. You can add/substitute ingredients to change flavors. Mix all the ingredients in a bowl. Taste to balance flavors. Top with Sev and serve Immediately. Sprouted Green Moong Dal Pancakes & Fritters! Curry Leaf Chutney and memories! Celebrating 100th Post with Chocolate Cupcakes! Mushroom and Chicken in Balsamic Sauce! Shrimp Pulao/Pilaf in Coconut milk! 3 Ways to Get Your Kids to Enjoy Vegetables! Aloo Paneer Poshto with a twist! Lemony Foxtail Millets: Powerpacked Breakfast!